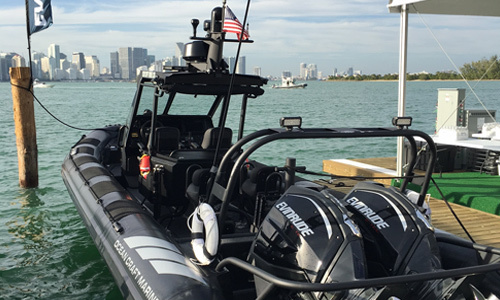 Ocean Craft Marine (OCM) will be featuring their latest and greatest Military and Law Enforcement Rigid Hull Inflatable Boat (RHIB) Design in the Miami International Boat Show on February 15-19, 2018 at Miami Marine Stadium Park & Basin, Virginia Key 3501 Rickenbacker Causeway Miami FL 33149 USA. The OCM boat will be in-water and available for underway demonstration. The OCM cutting-edge design features the latest state-of-the-art, shock-mitigating operator console. The entire console, equipment and crew are fully-suspended on twelve inches of full-floating, 3-axis, articulating pneumatic shock-absorbers. 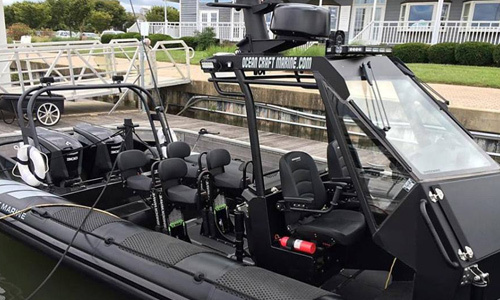 This unique Rigid Inflatable boat also features the latest in navigational and communication electronics as well as the newest Evinrude G2 Outboard Motors; 600 horsepower in all! Come visit OCM at the show and experience this incredible boat. We are located on the piers sharing in-water space with BRP/EVINRUDE/SEA DOO Booth F145, and SLIP 108-113,115,117-124.